Acidity is measured by the pH scale, which ranges from 1 - 14. A pH value of 1 is extremely acidic while a pH value of 14 is extremely basic. The pH of the mouth is generally 7 — neutral. Specific acid producing (acidogenic) bacteria attach themselves to dental plaque, the whitish sticky biofilm that collects and forms on the teeth. When you eat sugars or carbohydrates, these particular bacteria break down the sugars and produce acid as a by-product, which also makes the mouth more acid. At about pH 5.5, the minerals just below the enamel surface of the teeth begin to dissolve or “de-mineralize.” During this process, more calcium and phosphate leave the surface of the teeth than enter it — the first step in the decay process. 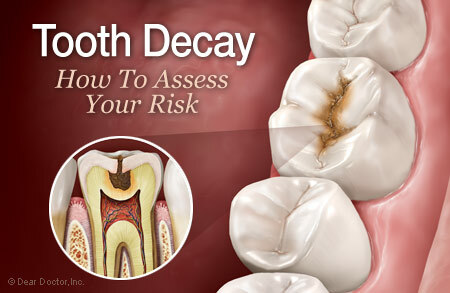 And because the layer beneath the enamel, and the roots of teeth are made of dentin, which is softer than enamel, it is more susceptible to decay. For example, the roots of an exposed tooth will de-mineralize quickly and easily with even weak acids at pH 6.2 - 6.8, which is closer to neutral saliva.